Note the bear cub, lower right of photo. Honestly , this is the first time I’ve looked at this picture and noticed the Kodiak bear cub. When i worked i had business cards so prior to retirement i made my own retirement card with this picture. Most thought it was a photo shopped picture. No, this is not a photo shopped picture. Yes, I must admit now that i was stupid but, not much more than say Petr or Ron. Later on in the day while we are talking to the President of the local tribal council she tells us; when she was young and on the way to school they needed to cross a small road bridge. Below and upstream the bears during salmon season always waited patiently for the spawning salmon. Once when they were on their way to school her brother was dared to count coup on a bear. Counting coup refers to the winning of prestige in battle by the Plains Indians of North America. Warriors won prestige by acts of bravery in the face of the enemy, and these acts could be recorded in various ways and retold as stories. Of course this skinny little eskimo heritage elementary school kid had no idea of native american indian acts. He simply climbed down the side of the bridge, while the bears were busy hauling in salmon, he grabbed one by the scrotum and pulled, and then ran back. Thankfully the salmon looked far better tasting than a skinny kid. A much smarter move than ours. All we had waiting for us was an old green running ford pickup. We were supposed to out run the bear, dive into the bed of the pickup and go. Photos taken with a cheap fuji film camera. The cool thing about this story is how we (Petr, Ron, John, and Gina) got here. We rode our Seadoos from the Port of Anchorage to Kodiak. Want to read more? Google wet dog race and Trawlercat. 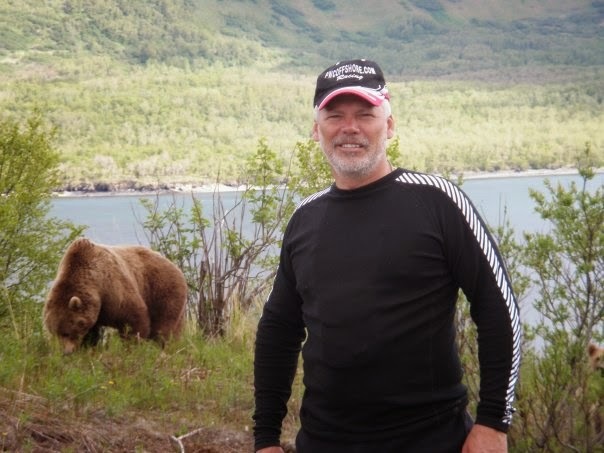 This entry was posted in Adventures, Uncategorized and tagged AK, Bear, kodiak, larsen bay, pictures. Bookmark the permalink.